There are only 35 more days until our trip to Walt Disney World! It is amazing how quickly time passes. We have been prepping for quite some time, but I still feel like there is so much more to do. Taking four special needs kiddos on a week long vacation to one of the most overly sensory stimulating places in the country is going to be challenging. I'm not going to lie. The situation becomes slightly more complicated with an autistic husband who's never been to Disney World himself. With all of that said, we're going to have an AMAZING time and the kiddos are going to do fabulously well. Why do I know this? Because we've prepared for EVERY possible scenario under the sun. "What's one thing about Disney World you're nervous about today?" I can not tell you how much these two questions have helped the kiddos on a daily basis as we prepare for our trip. Their anxiety levels have lowered significantly. All four kiddos are communicating emotions, worries, and concerns. If Jason and I can't help ease anxieties, we call Disney World to find out answers to questions they may have. We'll continue our morning ritual until we finally arrive home from our trip. The first day of our trip will be spent in Epcot. Jason and I have been preparing a schedule for the day for quite some time. We scheduled our fast passes. The kiddos watched online videos of attractions and shows in the park, before deciding what they wanted to do there. We studied the menus of every restaurant in Epcot and made our reservations. I seriously don't think I've ever prepared for a trip to this extent, but I know it will be worth it. Even after all I've already done to prepare, my husband can attest I've been a nervous wreck worrying about how Sunshine is going to do on this trip. Am I worrying too much? I don't think so. Sunshine is the most rigid and ritualistic person in the house. She does not transition well AT ALL. Waiting for anything for any length of time seems impossible to her. When Sunshine's schedule doesn't go as expected, or she doesn't transition well, or she's required to wait for something, she rages and is physically aggressive towards anything and anyone in her path. Her screams reach the pitch and volume of a smoke detector and can go on for hours. She bursts blood vessels in her face on a weekly basis, because the rages are so strong. So yeah... We're taking her to Disney World. Lol. I just keep thinking she's 3, and at 3 pretty much anything goes as far as behaviors are concerned, especially at a place like Disney World. I'm hoping she'll just blend in. Lol. Still, I would really love to enjoy myself. Thankfully, I have a few tricks up my sleeve. I know Sunshine much better than she knows herself. If she knows what's coming, and the plan doesn't change, she usually does okay overall. Sunshine loves learning time activities. If she's learning and keeping her hands busy, she'll usually sit still for a period of time. At no other time of day can she do this. Lastly, Sunshine doesn't understand the concept of time. She's always in the present and tries to understand the day in terms of meals and food. In desperate times of need, food is a fabulous distraction for her. 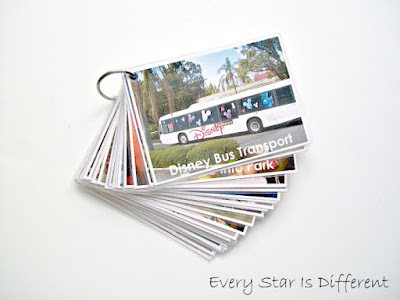 So, I present to you my plans to help Sunshine while we're at Epcot. I had so much fun putting everything together. The older kiddos are super excited about it all, and I'm sure they use everything just as much as Sunshine. Thanks to meal reservations, fast passes, and a lot of conversations with Disney cast members, our day in Epcot was pretty easy to plan out. We've gone through the schedule orally with the kiddos, but I know once we get there, all of the kiddos will need a picture schedule to help them make it through the day. 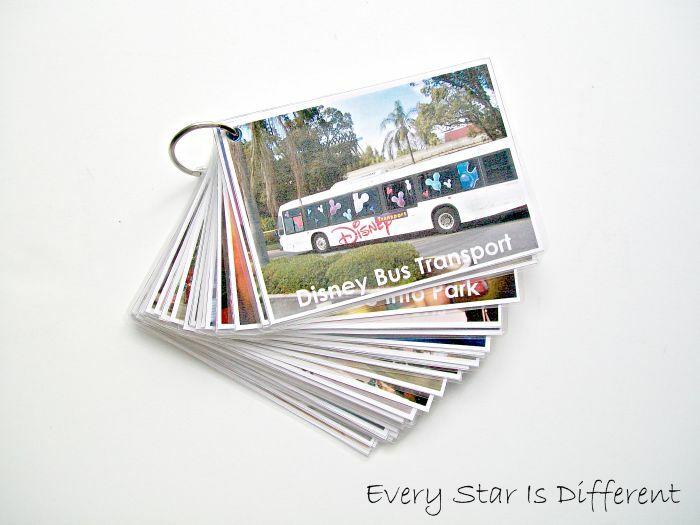 To make this picture schedule, I found pictures of various places and objects from Disney World on the internet. I then labeled them for the kiddos who read, laminated them, hole punched them, and put them in order using a metal ring. If for some reason our schedule does change due to weather or a ride closing, I can easily switch the order of cards by opening the ring. One can't fathom how many transitions there are through the course of the day, until you've lived with someone who doesn't transition well. This is why this picture schedule of our day is so thick. 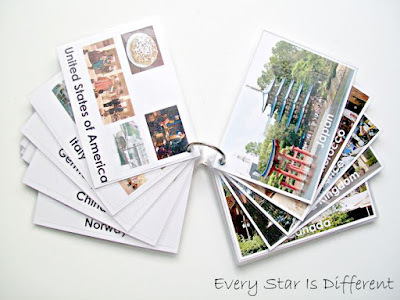 As we go through the country cards in the world showcase, I've included pictures of specific attractions, foods, objects, and characters the kiddos are excited to see on the back, so they'll know what to look for when we visit each country. When the kiddos wake up, before heading to Epcot, they'll notice Finding Nemo themed eggs placed throughout the hotel room. Each kiddo will be permitted to find four eggs, each filled with $1 in quarters. The quarters can be used for the penny machines in the parks or for the arcade in the hotel. 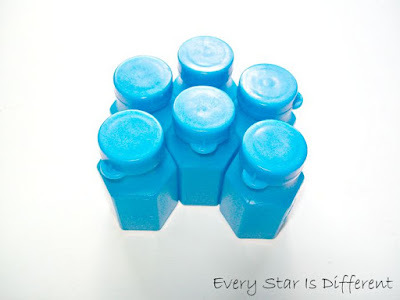 I thought this activity would be perfect for getting the kiddos up and motivated for the day. Our first attraction at Epcot is The Seas with Nemo & Friends, scheduled using a fastpass (Sunshine's choice). This will be followed by time spent at Sea Base. Then we end our Finding Nemo themed activities with a scheduled fastpass to Turtle Talk with Crush (Princess' choice attraction). I've planned three Finding Nemo themed busy bags, along with snacks to help us make it through this part of our day. All activities are placed on trays for the purpose of this post, but will be placed in Ziploc bags for our trip. These activities will be perfect for when we're sitting, waiting for Turtle Talk with Crush or taking a break at Sea Base. The kiddos can sequence Marlin's Journey in the movie using the figures provided. All figures come from our large animal collection at home. As a control, I've provided numbered pictures to match each figure. Most likely, Sunshine won't be able to sequence figures, but she can match figures to pictures, or just play with the figures. I've provided washable dry erase markers to use for coloring the laminated pictures, if needed. Links to all free coloring pages can be found below. I'm bringing along our Dry Erase Lapboard to use as a hard surface, and for drawing if needed. Sunshine loves fine motor tasks, especially if they involve little cards. (She has a major obsession with cards and receipts.) After selecting this busy bag she will use the paper clips to match up Finding Nemo themed number cards. There are two of each number in the stack. If she gets bored with that, I'll teach her how to link paper clips together. 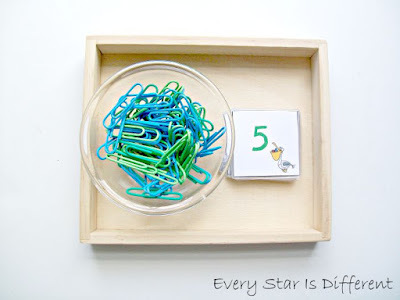 She can then link paper clips up to match the numbers on the cards. If the older kiddos are in need of an activity, I can simply pull out the paper clips for them to make necklaces. 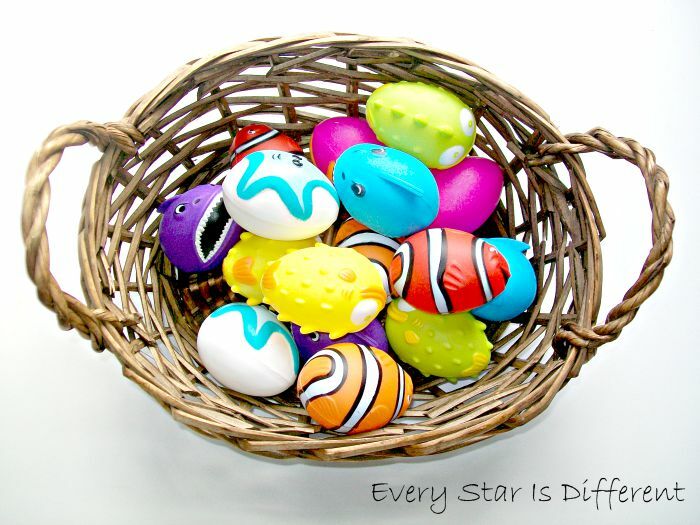 Source: The free Finding Nemo themed number cards can be found at Homeschool Creations. I came across the most adorable Dress It Up Buttons Disney Collection at the craft store a few months ago. This busy bag seemed to be the perfect excuse to use them. After adding a few ocean creature buttons I had quite a cute collection. Add a few pipe cleaners and a mini Play-Doh and we're good to go! 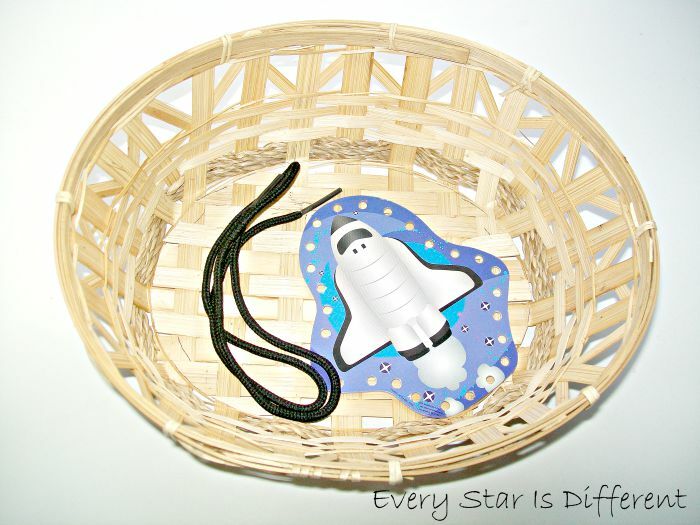 The kiddos can string the buttons or they can play with buttons in play dough. There are times when using busy bags will be possible, however there will also be times when we're standing in line and sit down activities aren't appropriate. 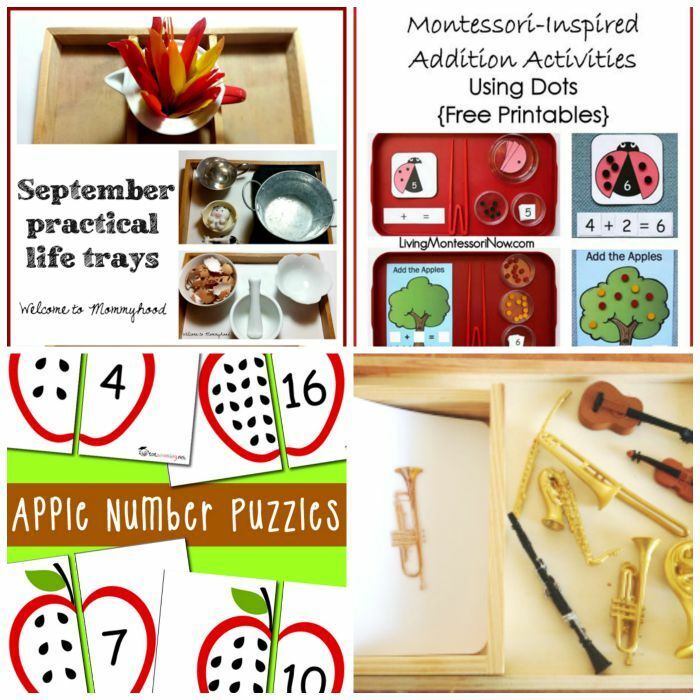 For those times, I've put together a few games and activities to help the time pass. Small bottles of bubbles will be a must! I'm just hoping not to use them all up while at guest services keeping the kiddos occupied while we go through that process. Lol. I thought the idea of bubbles to quite appropriate going along with our Finding Nemo theme. This is a spin off of Simon says, but I thought it perfect since Marlin is so over protective of Nemo and Dory all the time. We can't forget about snacks! 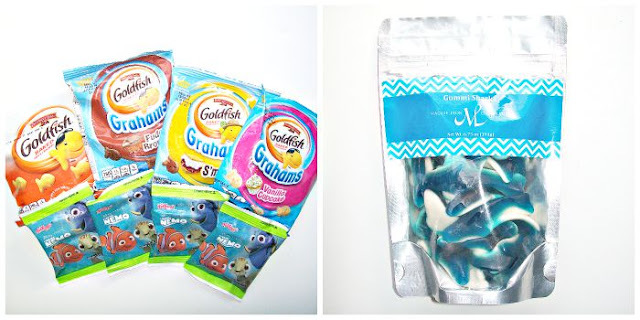 How about some Goldfish and Finding Nemo fruit snacks? Dinomite is so excited about gummy sharks too. After our Finding Nemo and Sea Base Adventures we head to the world showcase, first stopping in Mexico. Depending on time and lines, we may pick up a Mexican treat for the kiddos to try. We've already explained to them that while in Epcot they have many delicious foods to try. If we can all agree on one, Jason and I are fine with ordering one item in various countries for everyone to share. The kiddos can also decide what else they'd like to do in each country. Our lunch reservation is for Ackershus Royal Banquet Hall, where we'll dine with 4-5 Disney Princesses. The girls are extremely excited about this, however the boys feel the opposite. Lol. Each kiddo will have their own Junior Encyclopedia of Animated Characters for characters to sign. I'm hoping due to character visits, the kiddos won't need too much other entertainment during our meal. They can always browse through their encyclopedia. 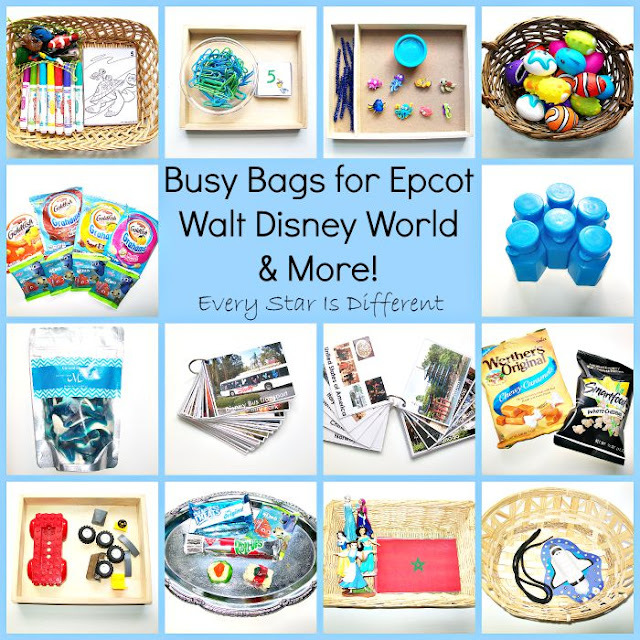 I did not plan many busy bags for the world showcase, as there seems to always be something to look at for the short length of time we're in each country. The kiddos are all about meeting characters and seeing live entertainment. They'll enjoy seeing a Viking ship, the Eiffel Tower, etc., but for the most part, it will be a quick run through of each country with some delicious snack samples from vendors. On the rare occasion that we do need a busy bag in the world showcase, I put this one together. There is a girl's version and boy's version, as my boys are not at all interested in princesses, (except for Mulan and Jasmine, but don't tell them I told you that). Lol. The girls are so excited to meet so many of their favorite princesses our first day in Disney World at Epcot. I thought it would be fun to match up princesses and their corresponding country flags, or just play with princesses. When I put this activity together, I did not realize that Princess' Mulan and Aurora figures had broken. Rest assured, new ones have been ordered and are on their way. Elsa and Anna are not at Epcot right now, but they will be very soon, so I included them in the activity. 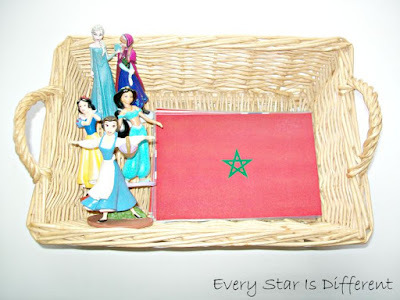 Princess loves her Disney Princess Mini-Figure Play Set #1 and Set #2 used for this activity. 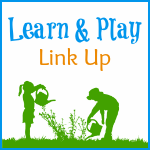 The boy version of the flag match up activity includes landmark and other figures to match up with flags. 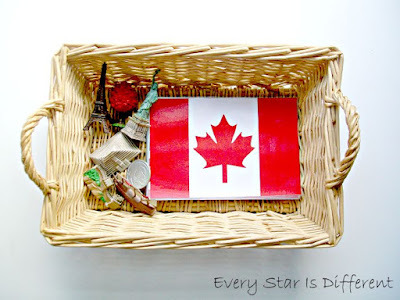 Source: I created the flag printable for these activities, for your free copy, click HERE. To keep the kiddos entertained while waiting in line if their bubbles are in fact gone by the time we make it to the World Showcase, we'll be playing "I'm Going on a Trip Around the World," a version of the game, "I'm going on a picnic, and I'm going to bring..., using the letters of the alphabet. We may have to team up with the kiddos, if they find the game too difficult, or not require things to be in alphabetical order, but no matter the version of the game, it should be fun. One can never have enough snacks on hand, especially when kiddos decide they don't like Norwegian cuisine for lunch, or that they forgot to eat their lunch because they were having so much fun with princesses visiting their table. Who's to say they'll like any snacks from around the world. I thought it wise to bring a few options from home. When I saw this kid's sushi for the first time I thought it was the most adorable snack. It turns out it tastes delicious too. One can use Swedish fish instead of fruit snacks, but since I have an overabundance of Finding Nemo fruit snacks, (They only came in a package of 20 pouches.) we're using those. The kiddos will break their rice krispie treats into the desired shapes, pull their fruit roll up into strips, wrap the rice krispie treats, and add the fruit snacks. 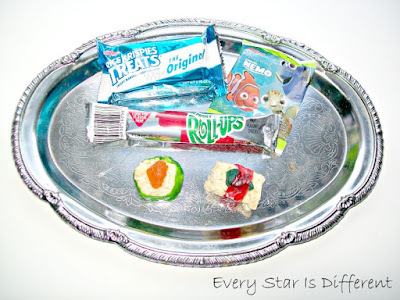 Or, the kiddos can just eat the individual snack items separately. I thought it quite appropriate to pick up some Werther's candy as we visit Germany. The kiddos have never tried it before, but it appears to be allergy friendly for most, so we'll give it a go. Canada has a popcorn stand. Instead of buying popcorn there, I thought we could bring our own. 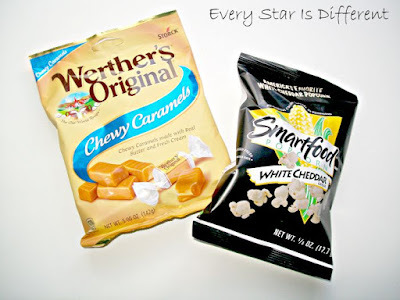 The kiddos love white cheddar popcorn. As always, I'll bring alternatives for Sunshine who can't eat the snacks I'm preparing. Dinner will be served at the Coral Reef Restaurant. I'm not sure which kiddo is more excited about dining while watching sharks swim by. Lol. Once dinner is finished we'll be heading to the ride Soarin' scheduled using a fast pass (Bulldozer's choice ride.) If the kiddos are up for more fun, they have shown interest in the rides Test Track, Mission Space, & Spaceship Earth (Dinomite's choice ride). I've prepared the following busy bags for Sunshine, in case we stay. She does not like rides that are fast or anything where her feet dangle. 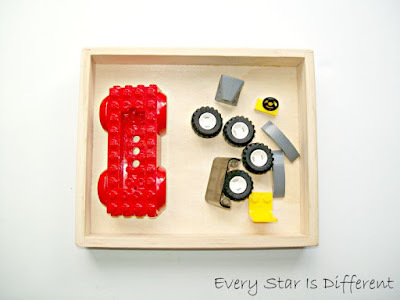 I grabbed some of the boys' LEGO pieces for Sunshine, so if the other kiddos build and test out their own car at Test Track, she can too, in Lego form. Sunshine loves lacing cards right now. I thought I'd take advantage of her new interest and add one to our busy bags. Hopefully she'll enjoy it. If the kiddos decide not to stay at Epcot after dinner, we'll head back to our hotel and swim before bed. We're going to try to keep the kiddos' as close to their regular sleeping routine as possible while on vacation. I have a feeling we're going to have a fabulous day in Epcot! Between busy bags, games to play while in line, and extra snacks, Sunshine should do quite well. I know I will rest a littler easier knowing at least I'm prepared for our first day at Disney. 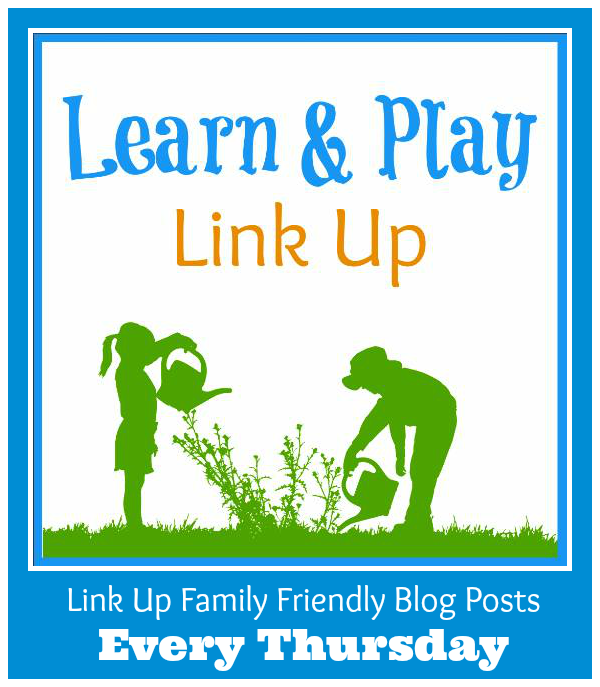 Welcome to to the Learn & Play Link Up!!! This week's features share fabulous inspiration and ideas for busy bags perfect for the season. 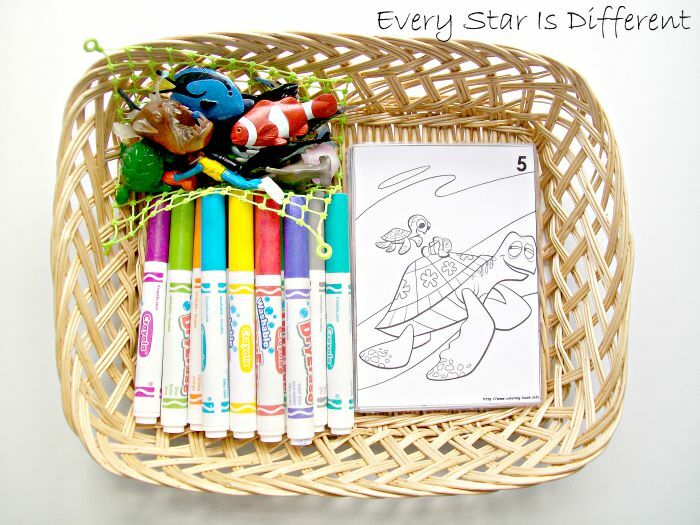 Most activities designed to fit a tray, can easily be used for a busy bag. No matter the age of your child, there's something for everyone! I hope you have a wonderful time in Disney! It definitely sounds like you are prepping for all the possibilities. Checking out the rides ahead of time online is definitely a good idea! We did that for several that we thought about using FastPass for -- and I was glad we did. We eliminated one, and for another ride I was able to reassure my sensory kiddo that it was going to be okay, and that the ride itself wouldn't be as dark and loud as it was in the waiting area. We liked being able to head back to the hotel for a break in the middle of the day, too, when things got a bit hectic. Thanks for hosting the linky today! I have to admit that I visited your blog accidentally but I am amazed. So many good posts and such a lovely visualisation. 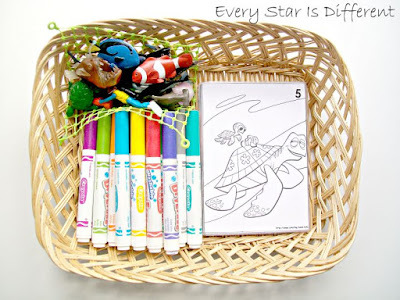 My son just loves coloring so I am happy to have new source of coloring pages. Where did you find those easter eggs? They are too cute and my kids would love them. My mother found them at a garage sale. You're right, they are super cute!